Start by making the cookies: preheat the oven to 180°C/350°F. Line two large baking sheets with baking paper. In the bowl of an electric mixer, fitted with the paddle attachment, beat the butter, brown sugar and confectioners’ sugar on medium-high speed until creamy. Add the peanut butter and beat to combine, scraping down the sides of the bowl. With the mixer on low speed, slowly add the oil, vanilla and egg and beat until just combined. Add the flour mixture beating just to combine. Roll the dough into balls – 1 ½ leveled teaspoons of dough per ball – and place them onto the prepared baking sheets, 2cm (1in) apart. Bake, rotating the sheets halfway through, until the cookies are golden brown on the edges, about 12 minutes. Transfer the baking sheets to a wire rack and let cool completely (unfilled cookies can be stored in an airtight container at room temperature for up to 1 week). Make the filling: combine the chocolate, peanut butter, confectioners’ sugar and salt in a medium bowl. In a small saucepan, bring the cream to a boil. Remove the cream from the heat and pour it over the chocolate mixture. Stir until the ingredients are melted and the mixture is smooth. Refrigerate until thick enough to spread. Using an offset spatula, spread the filling over the flat sides of half of the cookies. Sandwich with the remaining cookies*. Filled cookies are best eaten on the same day but can be kept in an airtight container in the refrigerator for up to 3 days. before even reading what the title of the filling was, my mind immediately jumped to a jam filling, like a peanut butter & jelly sandwich! you'd probably have to thicken the jam before spreading it between these cute cookies, huh? That Old Love tumblr is awesome. I had no idea about many of those pairs! 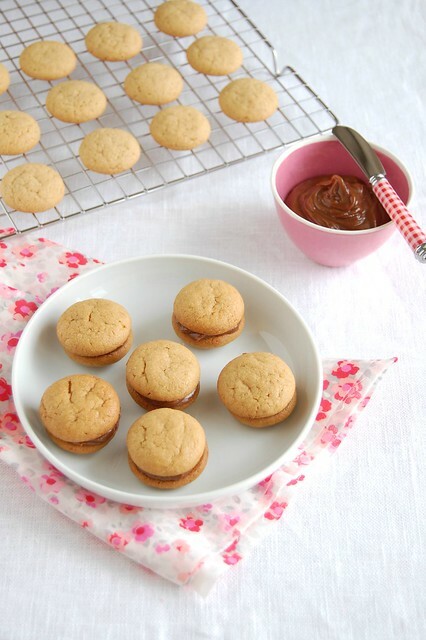 Peanut butter with chocolate is one of my fave combos - love a sandwich cookie! Tis cookie is really very delicious, soft and the creamy filling is smooth with just the right amount of peanut butter flavor. Thanks for guiding about one of the best cookie that you could find on market.